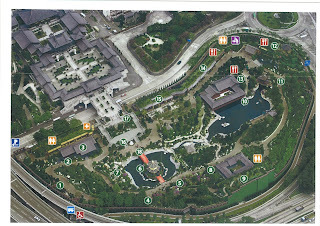 First of all, I would like to thank you Rejeev & Emey for comments about the virtual tour of Hong Kong-Nan Lian Garden. To wish all of you could enjoy the tour. So we may start now! After along a wide path in the west, the wooden wall design is of simple classic elegance, stands at the main entrance before entering the Nan Lian Garden, it is made of beech wood, the special features are three-bays formed by four columns, two tall columns at the top and paved with large stone slabs of form a wooden screen like a wall. It has the shadow in sunset because of the mask sunlight naming “Shadow Wall”. Everybody or will ask the question “Why establishes this wall here?” The reason is that the wall shelters the Garden from haphazard views and shields off noises from outside, leaving behind the hustle and bustle of the city. 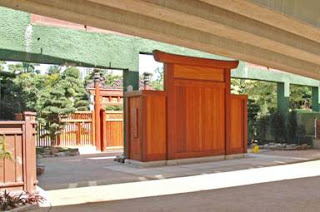 Passing the Shadow Wall, visitors enter the main gate of this ancient garden. On the opposite side of the Black Lintel Gate is the first view, Majesty of China’s lands and seas is revealed through symbolization, where are nine pieces of gorgeous greenish rocks symbolize the Nine States of China with the surrounding pones epitomize the Eight Seas, and some ancient Luohan pines greeting visitors. At its side is the wooden signboard-Nan Lian Garden. The calligraphy is by Professor JAO Tseung-I who is very famous in China culture field. The next spots wll be West Hill and Chinese Timber Architecture Gallery, See you later. My name is Allun, living in Hong Kong where is located the south part of Mainland China is a small modern city. In Feb this year, I have joined in the Chi Lin Nunnery, which is a Buddhism charity. My working place is in the Nan Lian Garden, where is designed as a garden in the style of the Tang Dynasty, a classical circulatory landscape garden based on the blue print of the Jiangshouju Garden in Shanxi Province, the shape of which bears a close resemblance to the Garden site. In 2003, the HKSAR Government invited Chi Lin Nunnery to join hands in promoting traditional Chinese culture to design and build a classical with art of landscape garden named Nan Lian Garden, Government would fund the infrastructure and construction works , and the other costs would be donated by Chi Lin as a contribution to the community. The Garden was opened to the public in November ,2006. To ensure that the valuable experience gained in the construction of the Garden can be continued in the future, Chi Lin has undertaken to be responsible for the maintenance, management and operation of the garden for a period of 5 years for a nominal fee of HK$1. Chi Lin would strive to establish a working model for the future of the Garden during this period. Part of my job is guiding a tour of the Nan Lian Garden to help visitor(s),mainly are China and Hong Kong Chinese people , appreciate the Garden. I want to hold a virtual tour and invited Vanessa and all our contributors to join in the tour of Nan Lian Garden, I will try to learn and use English guiding and explanting the tour on the specific scenic spots with picture on the blog., The tour will be planned to write into several separated paragraphs and continued to delivery on the blog every week or not more than 10 days. Welcome to raise questions, I will try to answer and share all I knew. Reading is that it is not the same activity each time you do it! When I read my novel in bed before switching the light off at the end of the day I read ’passively’ - I start at the top of the page and read the story steadily at the same speed (I sometimes even get to the bottom of the page before I fall asleep!). This type of reading for pleasure is often called ‘extensive reading’ by teachers. What is important about this type of reading is that you choose the book and you don’t worry too much about difficult words you come across. Your extensive reading may be ‘readers’ (shorter simpler versions of real novels) or more authentic materials written for any reader. You may not ‘enjoy’ the reading at first but (rather like taking exercise) you will see the benefits in the long run. But I actually wanted to think more about the other type of reading, intensive reading, which you do academically, for study, and when you read for study you are an ACTIVE reader. There is nothing passive about reading for study! If you start at the first word and read steadily through the text it is unlikely that you are going to achieve your goals. What are your goals for reading the text? Are you sure you want to read the text at all? How do you know if it will be useful for you? What parts of the text will be useful? What point is the writer making? What notes will you make? What are your notes for? All these questions make you into an ACTIVE READER as you employ a variety of strategies to help you meet your goals and over the next few posts I’d like to give you some tips on how to start developing or continue improving your reading strategies. The starting point is to raise your awareness of the topic of academic reading and for that I am pointing you to this page on Study Advice and Learning Development from the University of Reading. This page gives you an overview of the issue of academic reading and you can read it here. Many ESL educators favor evaluating by scaling over test taking. This type of scaling is most frequently used to judge oral proficiency via an interview format. How well do you think scaling would work in, say, evaluating capacity to write or read academic or professional material? What, if any adaptations, would be necessary? 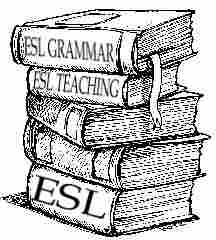 Level 5 (educated native speaker): no trouble using the language. errors. At ease in the target language milieu. better in some areas than others. Level 1 (beginner) little or no familiarity with the target language.